Theravada (Pali; Sanskrit: Sthaviravada) is one of the eighteen (or twenty) NikÄya schools that formed early in the history of Buddhism. These developed in India during the century subsequent to the death of the Buddha. The name of the school means «Teachings of the Elders» which implies that this was the most conservative school of Buddhism, a school that has attempted to conserve the original teachings of the Buddha. Adherents trace their lineage back to the Sthaviras (Pali: Theras; «Elders») of the First Buddhist Council when 500 arahants, including Mahakasyapa chose a position of orthodoxy to keep all the «lesser and minor» rules set by Gautama Buddha. Theravada is the longest surviving of the twenty schools, and for many centuries has been the predominant religion of Sri Lanka and continental Southeast Asia (parts of southwest China, Cambodia, Laos, Myanmar, and Thailand). It is also gaining popularity in Singapore and Australia. It is sometimes spuriously labeled as Hinayana («Inferior Vehicle») in opposition to the Mahayana («Greater Vehicle»), but this term is now widely seen as either inaccurate or derogatory. Theravada is sometimes referred to as Southern Buddhism. The oldest surviving use of the term Theravada in writing appears in the 7th century CE in that school’s own manuscripts. In that document, according to Andre Bareau (Les sectes bouddhique du Petit Vehicule, p. 205), Theravada defines itself as a separate school, in distinction to the Mahasanghika, the Sarvastivada, and the Sammatiya. Today Theravada Buddhists number over 100 million worldwide, and in recent decades Theravada has begun to take root in the West. Theravada promote the concept of Vibhajjavada (Pali), literally «Teaching of Analysis» which uses critical methods of investigation as opposed to blind faith. With this method the answer has to be discovered by the aspirant, after being convinced by valid thought and experience, in order to reach the first glimpse of the goal. The Theravadins goal is the achievement of the state of Arahant (lit. «worthy one», «winner of Nibbana«), a life where all (future) birth is at an end, where the holy life is fully achieved, where all that has to be done has been done, and whereupon there is no more returning to the worldly life. In the Theravadin view, the attainment of arahatship is equal in every way to the realization attained by the Buddha himself. The Buddha remains a figure of respect and worship even for arahats because he was able to attain nibbana without the aid of any teacher or outside instruction—he is said to be ‘fully self-enlightened’ in many Pali verses of praise. Only after the development of the Mahayana did the insight or knowledge attained by an arhat come to be seen as a lesser form of that attained by the Buddha himself. Traditionally, Theravada Buddhism has observed a distinction between the practices suitable for a lay person and the practices undertaken by ordained monks (and, in ancient times, nuns). While the possibility of significant attainment by laymen is not entirely disregarded by the Theravada, it occupies a position of significantly less prominence than in the Mahayana and Vajrayana traditions. This distinction — as well as the distinction between those practices advocated by the Pali Canon, and the folk religious elements embraced by many monks — have motivated some scholars to consider Theravada Buddhism to be composed of multiple separate traditions, overlapping though still distinct. Most prominently, the anthropologist Melford Spiro in his work Buddhism and Society separated Burmese Theravada into three groups: apotropaic Buddhism (concerned with providing protection from evil spirits), kammatic Buddhism (concerned with making merit for a future birth), and Nibbanic Buddhism (concerned with attaining the liberation of nibbana, as described in the Tipitaka). These categories are not accepted by all scholars, and are usually considered non-exclusive by those who employ them. The role of lay people has traditionally been primarily occupied with activities that are commonly termed ‘merit making’ (falling under Spiro’s category of kammatic Buddhism). Merit making activities include offering food and other basic necessities to monks, making donations to temples and monasteries, burning incense or lighting candles before images of the Buddha, and chanting protective or merit-making verses from the Pali Canon. Some lay practitioners have always chosen to take a more active role in religious affairs, while still maintaining their lay status. Dedicated lay men and women sometimes act as trustees or custodians for their temples, taking part in the financial planning and management of the temple. Others may volunteer significant time in tending to the mundane needs of local monks (by cooking, cleaning, maintaining temple facilities, etc.). Lay activities have traditionally not extended to study of the Pali scriptures, nor the practice of meditation, though both of these barriers have been much relaxed since the 20th Century. Nibbana, the highest goal of Theravada Buddhism, is attained through study and meditation. This goal (and its associated techniques) have traditionally been seen as the domain of the fully ordained monastic. Monastic roles in the Theravada can be broadly described as being split between the role of the (often urban) scholar monk and the (often rural) meditation monk. Both types of monks serve their communities as religious teachers and officiants by presiding over religious ceremonies and providing instruction in basic Buddhist morality and teachings. Scholar monks undertake the path of studying and preserving the Pali literature of the Theravada. They may devote little time to the practice of meditation, but may attain great respect and renown by becoming masters of a particular section of the Pali Canon or its commentaries. Masters of the Abhidhamma, called Abhidammika, are particularly respected in the scholastic tradition. Meditation monks, often called forest monks because of their association with certain wilderness-dwelling traditions, are considered to be specialists in meditation. While some forest monks may undertake significant study of the Pali Canon, in general meditation monks are expected to learn primarily from their meditation experiences and personal teachers, and may not know more of the Tipitaka than is necessary to participate in liturgical life and to provide a foundation for fundamental Buddhist teachings. More so than the scholastic tradition, the meditation tradition is associated with the attainment of certain supernatural powers described in both Pali sources and folk tradition. Stream-Enterers — Those who have destroyed the three fetters (self-belief, doubt, and faith in the efficacy of rituals and observances), will be safe from falling into the states of misery (they will not be born as an animal, hungry ghost, or hell being). At most they will have to be reborn only seven more times before attaining Nibbana. Once-Returners — Those who have destroyed the three fetters (self-belief, doubt, and faith in the efficacy of rituals and observances), and the lessening of lust, hatred, and delusion. They will attain Nibbana after being born once more in the world. Non-Returners — Those who have destroyed the five lower fetters (that bind beings to the world of the senses), They will never again return to the human world. After they die they will be born in the deities worlds, there to attain Nibbana. Arahant — Those who have reached Enlightenment, awakened to the Nibbana and have reached the quality of deathlessness, free from all the fermentations of defilement; whose ignorance, craving, attachments, and karma have ended. 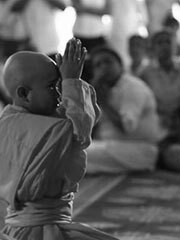 In most Theravada countries, it is common practice for young men to ordain as monks for a fixed period of time. In Thailand and Myanmar, young men typically ordain for the 3 month Rain Retreat (vassa), though shorter or longer periods of ordination are not uncommon. Traditionally, temporary ordination was even more flexible among Laotians. Once they had undergone their initial ordination as young men, Laotian men were permitted to temporarily ordain again at any time, though married men were expected to seek their wife’s permission. Throughout Southeast Asia, there is little stigma attached to leaving the monastic life. Monks regularly leave the robes after acquiring an education, or when compelled by family obligations or ill-health. Ordaining as a monk, even for a short period, is seen as having many virtues. In many Southeast Asian cultures, it is seen as a means for a young man to ‘repay’ his parents for their work and effort in raising him, because the merit from his ordination accrues to them as well. Thai men who have ordained as a monk may be seen as more fit husbands by Thai women, who refer to men who have served as monks with a colloquial term meaning ‘cooked’ to indicate that they are more mature and ready for marriage. Particularly in rural areas, temporary ordination of boys and young men traditionally gave peasant boys an opportunity to gain an education in temple schools without committing to a permanent monastic life. The ceremony performed for temporary ordination is typically the samana (or novice) ordination that monks undergo when they begin their training. Even in Southeast Asian countries that encourage temporary ordination, the ‘higher’ or full ordination as a Theravada *bhikkhu* is often reserved for those who intend to take the robes permanently. As such, the temporarily ordained may be subject to fewer precepts and disciplinary rules than full monks. Different orders, which are referred to as nikayas, has not resulted in the development of separate doctrines. The Supreme Patriarch of the Sangha, the highest ranking monk in any given country, may come from any of these Nikayas. Sri Lanka — Siam Nikaya, Amarapura Nikaya and Ramanna Nikaya. Thailand — Thammayut Nikaya and Maha Nikaya. Myanmar — Thudhamma Nikaya and Shwekyin Nikaya. The diversity of Buddhist thought has sometimes led to criticism of Theravada by other schools, although it is important to note that such criticism is far from universal, and that Buddhists of different schools often interact on terms of mutual respect. Common critiques of Theravada made by Mahayana Buddhists are that Theravada monks aim to achieve enlightenment only for themselves, and that they lack compassion. However, supporters of Theravada emphasize that their religion does not recognize a self at all—famously, as noted in the canonical , sometimes translated as «all phenomena are not-self». As for supposed lack of compassion, metta (often translated as «loving kindness» or «good will») is among Theravada’s 10 perfections. Theravadans frequently meditate on metta and focus on metta. Theravada monks have sometimes also been criticized for following their monastic rules blindly, although, in fact, they are allowed to break the rules in extreme situations, such as to save another person’s life. Some other schools have also charged that Theravada practice is the slowest path to enlightenment, taking many eons to reach its goal. However, from their own perspective, Theravada Buddhists see the Buddha and the ancient arhats as examples of practitioners who became enlightened in one lifetime. Naturally, every school will differ on what exactly is the most effective and efficient path to realize the dhamma.